You’ve heard of the paleo diet… You’ve heard of the gluten-free diet… And if you haven’t heard about the FODMAP diet in conversation at work or at the gym yet…it’ll only be a matter of time before you start hearing about FODMAPs. The low-FODMAP diet is rising in popularity, but unlike most diets, its end goal isn’t weight loss. Before you jump on the FODMAP wagon though, what’s most important is to assess whether this diet is for you. Otherwise, you’re giving up nutrient-rich foods for no reason, which would be a shame to both your taste buds and your body! FODMAPs are short-chain carbohydrates found in many common foods. If you have SIBO (small intestinal bacterial overgrowth), the carbohydrates aren’t fully absorbed in the body. These carbohydrates then end up fermenting in the digestive tract. The fermentation actually feeds the bacteria, which is what causes GI discomfort such as: gas, bloating, pain, constipation, and diarrhea. SIBO is when bacteria takes over your small intestine. The small intestine is where food intermingles with digestive juices and the nutrients are absorbed into the bloodstream. Bacterial overgrowth ends up interfering with the digestive and absorption process when food passes through. As a result of SIBO, the malabsorption of nutrients like fat-soluble vitamins (Vitamin A, D, E, K) and iron can quickly become a problem. A symptom commonly associated with IBS (irritable bowel syndrome) is poor nutrient absorption and it may even lead to damage of the stomach lining. One way is to see your doctor about any GI symptoms and ask about a breath test or any other diagnostic tests that they deem most reliable since some breath tests have been known to have false negative results. How can you treat SIBO nutritionally? One way is to spread your meals (spread meals by about 4 hours) and avoid overeating in one sitting — it’s one of the worst things you can do. Another way is putting yourself on the low-FODMAP diet. No, not always. A low-FODMAP diet focuses on small-chain carbohydrates intake and gluten is a protein. Wheat, barley and rye contain gluten, as well as fructans, which are a source of FODMAP carbohydrates. Since a low-FODMAP food plan minimizes wheat, barley and rye, gluten intake is often minimized also. Still think the low-FODMAP diet is for you? I recommend a two-week test run to decide if this diet is the for sure solution to your gastrointestinal problems. By eliminating FODMAPs, the goal is to: repair the intestinal lining, ease inflammation, get rid of the bacterial overgrowth and eat a diet rich in the essential nutrients that your body hasn’t been absorbing. To help you with eliminating FODMAPs, I’ve created a High and Low FODMAP List of what foods are allowed for your easy reference. No problem! Just simply start the two-week period again. 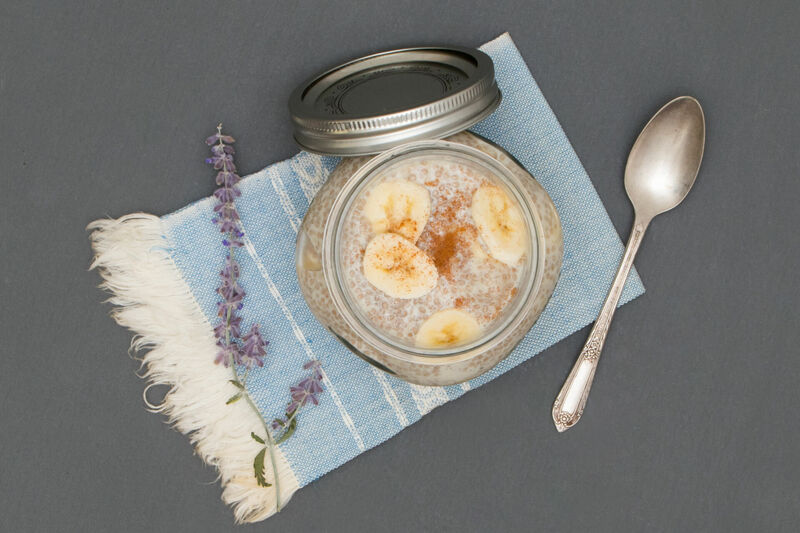 To get you started on the low-FODMAP diet, try our Banana Chia Pudding — one of my favs from PowerPerks — the next time you have breakfast! I recommend doubling the ingredient measurements so you’re able to have a guaranteed FODMAP-free breakfast for another day. Watch what I shared on ABC7’s Eye Witness News about the FODMAP Diet. Place milk and chia in a jar and stir. Next, mix in sliced banana and cinnamon. Refrigerate overnight. Before enjoying, top with almonds.